Learn how to make rice pudding with any kind of rice, whether it’s cooked or raw, and with any kind of milk. All it takes is a few basic ingredients to serve it warm or cold. The first time I ever had rice pudding was when I was in college. I spent a semester in Spain and the señora in the family I lived with made us rice pudding nearly every night. This amazing woman often spent all day cooking, and made the rice pudding fresh in the morning and allowed it to chill all day long. She cared for us with tons of love and kindness—until we moved because we were young and stupid and thought we could do better. 😶And I’ve been chasing something like her recipe (and running away from my shame at that youthful indiscretion) ever since. 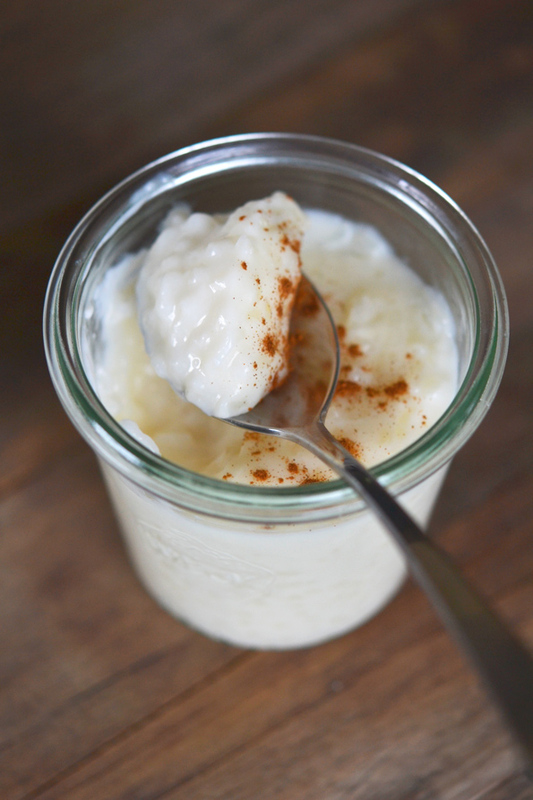 If you didn’t grow up eating rice pudding, it might sound a bit … strange. But if it’s made right, whether it’s chilled or warm, firm or soft, it’s always delicious. Unless you hate, well, pudding of all kinds (and maybe puppies 🐶and rainbows 🌈 too? ), you must love rice pudding. It’s easy to forget how elegant something as simple as this can be. There’s no flour and no cornstarch in any of these versions. And if you make it on the stovetop from raw rice, you don’t even need an egg. In fact, you need little more than rice, milk, and some sweetener to make a thick and creamy pudding that’s naturally gluten free. My first recipe for rice pudding and the one I made for years without regret was made on the stovetop with freshly-made short grain (usually arborio, or risotto rice) rice that I parlayed immediately into a creamy pudding. That version is in my first cookbook (and its second edition) and it works beautifully. But it does take a bit of time (and a couple of pots). Recently, I started to wonder how to make rice pudding with cooked rice, and if that would make the recipe a bit more forgiving. It turns out that, not only can you make rice pudding with cooked rice, you can use any type of rice you like—plus any milk at all. Then, I use my Instant Pot many times a week anyway, and I have a dogeared copy of Melissa Clark’s Dinner In An Instant (that’s an affiliate link) and make rice in the IP all the time. So naturally, I wondered if I could slide right into a raw-rice IP version of rice pudding. Spoiler: I could. I did! Once you learn how to make rice pudding on the stovetop with cooked rice, you might be tempted never to make it any other way again. I’ve made it successfully with any sort of sticky, cooked rice, from arborio rice to sushi rice to long grain white rice. If you’re making rice for a meal, do yourself a favor and make a bit extra and set it aside to make into rice pudding. If you’ve got that in the back of your mind, go ahead and make the rice with a bit less water than usual so that it comes out nice and sticky. Another trick for getting cooked rice to turn sticky, even if it’s not shorter grain, naturally high starch rice is to undercook it on the stovetop by a few minutes. In other words, stop cooking before every last bit of water is absorbed by the rice. Then, turn off the heat and allow the pot to sit, covered, on the burner for until it cools. You’ll be rewarded with sticky rice, even if it’s long grain. Originally, the video for this recipe was of the stovetop method with cooked rice, since it’s the most forgiving version. But when I misplaced the raw video footage, after the (mild) swearing, I decided it would be more informative to shoot a video of the Instant Pot version. My Instant Pot is the 6-quart version, but I think that this modest amount of rice pudding can be made in a smaller Instant Pot without incident. Don’t be tempted to double the recipe, though, and cook it all at once in your pressure cooker. Cooking milk in a pressure cooker requires a ton of breathing room. If you double the recipe, or even make 1 1/2 times the amount, your pot will most likely boil over. Trust me when I say that you do not want to deal with a milk overboil situation—especially with your pressure cooker. In the stovetop version with raw rice, my original version, I steep some whole cinnamon and whole nutmeg in the milk to add some depth to the pudding. But of course those steps are optional. You can do the same with the Instant Pot version, in fact. All you need to remember about the stovetop version with raw rice is not to overcook it. Simmer it in water just until it has absorbed most of the liquid before pouring in the simmering milk. If you’d like an even quicker and easier version of rice pudding (one that’s dairy-free, too) that requires almost no tending, kindly turn to page 179 of Gluten-Free on a Shoestring Quick and Easy. That one even has a thin and lightly sweet crust on top that just … sends me. Dairy-free: This one is super easy. If you can’t have dairy, just replace the cow’s milk in each version with your favorite nondairy milk—as long as it’s not fat-free. My favorite nondairy milk is unsweetened almond milk. If you use a sweetened dairy milk, you might want to use less granulated sugar in the recipe, but that is to taste. I don’t recommend using coconut milk in a can, as it’s too thick, as a replacement for the milk. However, you can use canned coconut milk as a replacement for the heavy cream in the Instant Pot version. Egg-free: The raw-rice stovetop version is egg-free, so I’d recommend making that version if you can’t have eggs. It’s all ready for you. Instead, if you’d like to try making the other versions without the egg, you can try replacing the egg with a cornstarch slurry in place of the egg and milk mixture. Just place the remaining half-cup (for the stovetop, cooked rice version) or 3 tablespoons (for the Instant Pot version) of milk in a small bowl and whisk in 2 tablespoons of cornstarch until it forms a thick, integrated liquid. Then add it to the main mixture and whisk until the pudding thickens. Rice: If you want truly creamy rice pudding, unless you’re making it with cooked rice on the stovetop according to the directions below, you need to use a short grain rice. I like sushi and arborio rice equally well in this regard. If you’re making rice pudding on the stovetop with cooked rice, you can easily swap in sticky short grain brown rice as well. I don’t recommend using brown rice otherwise. Open the lid of the pot, and turn the instant pot back on to sauté by pressing the “Sauté” button. Once the mixture begins to simmer, in a small bowl, whisk the remaining 3 tablespoons of milk and the egg. Beginning with a very small amount of the simmering rice pudding, temper the egg (slowly raise its temperature so the egg doesn’t scramble) by adding some of the simmering rice pudding to the egg mixture and whisking to combine. Transfer the egg mixture to the instant pot bowl, and allow to simmer, stirring constantly, until it thickens enough that a spatula along the bottom of the instant pot leaves a visible trail that the mixture takes a moment to fill. For the stovetop with cooked rice: In a medium saucepan, place the cooked rice, 1 1/2 cups (12 fluid ounces) milk, sugar, and salt over medium heat. Cook, stirring frequently until the mixture comes to a simmer and begins to thicken (about 8 minutes). Place the remaining 1/2 cup milk and the egg in a separate bowl, and whisk to combine well. Add about 1 cup of the hot milk and rice mixture to milk and egg mixture, a bit at a time, whisking to combine. Transfer the egg mixture to the saucepan and continue to cook until the pudding has begun to thicken, about 2 to 3 minutes more. Remove the saucepan from the heat, stir in the optional vanilla extract, and mix to combine. For the stovetop with raw rice: In a large saucepan, place the water, rice, and salt, stir to combine and bring to a boil over medium heat. Reduce the heat to a simmer, and cook stirring frequently for about 10 to 15 minutes, or until the rice has absorbed most of the water, leaving behind no more than a bit of thick, starchy water. Be careful not to overcook the rice. While the rice is cooking, in a separate, medium-size saucepan, combine the milk, sugar, optional whole cinnamon and nutmeg, and cook over medium heat until simmering (about 2 minutes). Once the rice in the separate saucepan is cooked, pour the simmering milk mixture through a strainer into the larger saucepan. Discard the whole cinnamon and nutmeg. Cook the rice and milk mixture over medium-low heat, stirring frequently until the rice has absorbed most of the milk mixture and the entire mixture has thickened and begins to appear pudding-like, about 15 minutes more. It will thicken as it cools. Add the optional vanilla, and mix to combine. For all versions, add the optional vanilla and mix to combine. Transfer the prepared rice pudding to serving dishes and serve warm with ground cinnamon to taste. Alternatively, for a firmer pudding, place plastic wrap directly on the surface and allow to cool at room temperature until no longer hot to the touch. Cover tightly and refrigerate for at least an hour before serving chilled with ground cinnamon to taste. Originally published on the blog in 2013. Variations added, most photos and video all new. Most text new. Stovetop version with raw rice minimally adapted from Gluten-Free on a Shoestring: 125 Recipes For Eating Well on the Cheap (Hachette/Perseus 2017). Gosh, I totally forgot about my Nana’s rice pudding until seeing this recipe. What sweet memories. I’m looking forward to trying it out. Where did you find the individual glass serving containers that the pudding is served in? They are ADORABLE! Love them! They’re Weck brand canning jars. I have been collecting and using Weck jars forever for their utility and their beauty! They are from their “tulip jars” line, and I believe they are #744, the 1/2 liter jars. If you google that, you should be able to find them. They sell them on their own website, but also at places like Crate & Barrel and Sur La Table online. Not allowed nuts either. At age 73, giving up so many favorite foods is pretty depressing…but thanks. I’m looking forward to the bread class when I have time to watch it! Oh no that’s a shame, Janice! Have you ever tried Ripple brand milk? It’s made from peas, so it’s nut free, lactose free, dairy free, gluten free, etc. and it really is excellent. I’ve found it at Whole Foods. It might be a good solution for you. Will it work with lactose free milk? I really miss rice pudding and no pudding type recipe has worked so far. I’m not a big fan of lactose free milk in general, Janice, since it has other additives to make up for the lack of lactose. I’d recommend using unsweetened almond milk instead. Nicole you are awesome I love your recipes and you have totally put me in the mood for some rice pud! I grew up with rice pudding as it is a very traditional dessert in Scotland but we tend to bake ours. I usually use 100g pudding rice, 750 mls semi skimmed or full fat milk, 25g castor sugar and a good knob of butter (that’s what gives it a great skin) and some cinnamon and nutmeg to taste. It needs a low oven (150 -160c) and about 1 hour 40 mins to 2 hours baking time. I never thought of vanilla so looking forward to trying it that way. I’m so happy to see this recipe! Thank you …. you are the best ….the only one out there who always gives ideas for different food intolerances. This looks amazing. I am going to try this with almond milk as we are dairy free as well as gluten-free. Ooooh it’s awesome with almond milk, Kim. Good call. I mostly like it cold on account of the pudding skin, which I love dearly. But it is lovely warm, Donia. No arguing with that. I know what I am making this morning. I love rice pudding! And my husband loves cinnamon and nutmeg. Thank you!